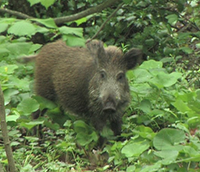 Wild boar are native across much of Northern and Central Europe, the Mediterranean region (including North Africa's Atlas Mountains) and much of Asia, including Japan and as far south as Indonesia. Adult boars can measure from 90 to 200 cm (35 to 79 in) in length, not counting a tail of 15 to 40 cm (5.9 to 16 in), and have a shoulder height of 55 to 110 cm (22 to 43 in). As a whole, their average weight is 50--90 kg (110--200 pounds). Wild boar piglets are coloured differently from adults, having marbled chocolate and cream stripes lengthwise over their bodies. The stripes fade by the time the piglet is about 6 months old, when the animal takes on the adult's grizzled grey or brown colour. Adult males are usually solitary outside of the breeding season, but females and their offspring (both sub-adult males and females) live in groups called sounders. Sounders typically number around 20 animals, although groups of over 50 have been seen, and will consist of 2 to 3 sows; one of which will be the dominant female. Group structure changes with the coming and going of farrowing females, the migration of maturing males (usually when they reach around 20 months) and the arrival of unrelated sexually active males. Wild boar are situationally crepuscular or nocturnal, foraging in early morning and late afternoon or at night, but resting for periods during both night and day. They are omnivorous scavengers, eating almost anything they come across, including grass, nuts, berries, carrion, nests of ground nesting birds, roots, tubers, refuse, insects and small reptiles. If surprised or cornered, a boar (particularly a sow with piglets) can and will defend itself and its young with intense vigour. (Wikipedia). The chamois, (Rupicapra rupicapra), is a goat-antelope species native to mountains in Europe. The chamois is a mid-sized bovid. 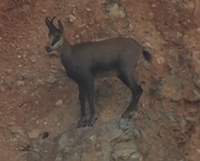 A fully grown chamois reaches a height of 70--80 cm (28--31 in) and measures 107--137 cm (42--54 in). Both males and females have short, straightish horns which are hooked backwards near the tip, the horn of the male being thicker. Female chamois and their young live in herds of up to 100 individuals; adult males tend to live solitarily for most of the year. Chamois eat various types of vegetation, including highland grasses and herbs during the summer and conifers, barks and needles from trees in winter. Primarily diurnal in activity, they often rest around mid-day and may actively forage during moonlit nights. Chamois can reach an age of 22 years in captivity, although the maximum recorded in the wild is from 15 to 17 years of age. (Wikipedia).